Following on from an excellent result in the Berliner Wein Trophy this year with five Gold Medals, Long Wines is celebrating once again after winning another Gold and three Silver medals in the Concours Mondial de Bruxelles 2016 for wines in the core portfolio, along with one Silver medal and four Bronzes in the Decanter Wine Awards 2016, and three Bronze Medals in the International Wine Challenge 2016 in London. A Gold medal went to Castillo del Rey Tempranillo 2015 – proof of the exceptional value-for-money that this wine made in Cataluña offers. Bos Tinta de Toro 2014 from DO Toro swept the board with a Silver Medal in both the Decanter World Wine Awards and the Concours Mondial de Bruxelles 2016, and a Bronze in the International Wine Challenge 2016. Calamar Verdejo 2015 from DO Rueda and Casa Natal 2014 – a blend of Garnacha and Cariñena from DO Montsant – both won Silver Medals in the Concours Mondial de Bruxelles 2016 and Bronze Medals in the Decanter World Wine Awards 2016. 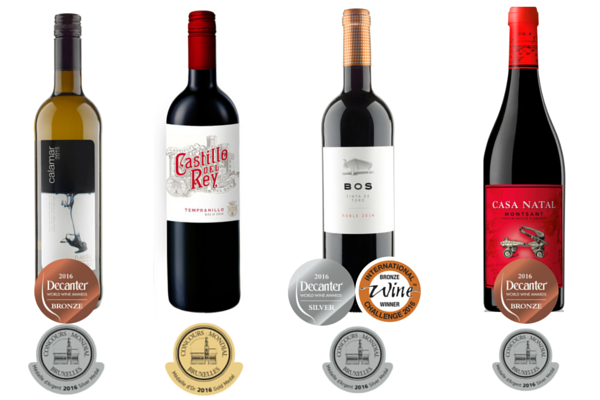 Further Bronze medals went to Finca Mónica Crianza 2013 (DOCa Rioja) and Casa del Canto Roble 2012 (DO Yecla) in the Decanter World Wine Awards 2016; while Catanga Organic Tempranillo 2015 (Vino de la Tierra de Castilla y Leon) and Chispas Shiraz 2015 (DO Campo de Borja) also won Bronze medals in the International Wine Challenge 2016. All excellent representatives of modern Spanish wine and the quality and value-for-money that the Long Wines portfolio offers.